These days it seems quite common for wedding gift lists to be cash/vouchers but when two of my closest friends said their gift list was with their honeymoon travel agent, I knew I wanted to do something else for them as well. I’ve got nothing against the whole cash/vouchers thing at all, but it just happens that at the moment I have the time and inclination to mess around with crafty stuff, whereas for past weddings I’ve been working 80 hour weeks and tbh, remembering to buy the voucher was stretching enough! The pinterest stalking for suitable gifts began nearly a year ago, and I eventually came up with a plan to design a monogram type graphic and get it engraved onto a wooden chopping board. However, last November-ish, before I could properly investigate engraving companies, I randomly found a pyrography tool in Lidl for about £8 (got to love the random stuff they have in their weekly specials, my sewing machine and serger are also from there!) and figured I might as well try to do it myself first. A few weeks before the wedding, as I finally sat down to design the monogram, I remembered the personalised illustration on their wedding invitation (that they had painted by this seller on Etsy) and thought that it could look pretty cool instead. I figured I had enough time to redo it or go with the monogram design if it didn’t work out, but it actually turned out better than I hoped! I took a photo of the illustration and then spent a while getting frustrated at GIMP because it’s been ages since I used it and I’d forgotten everything I ever knew about it. Anyway, the end result was a black and white simplified version (basically minus a lot of the hearts, dots and stars) that I thought could look a bit blurred once burned onto the wood. I printed this out and unsurprisingly failed at transferring the image by heat as I don’t have the right type of printer for that to work, so resorted to the old school scribbling all over the reverse side and then tracing the image onto the wood. The actual pyrography went pretty quickly once the large letters were complete and I used the same fine nib (is it even called a nib?) for the whole thing. Typically, the perfectionist in me finds all the little bits I messed up to be glaringly obvious (and really annoying! ), i.e. don’t look at the way too fat plane, but the bride and groom were impressed so I’m happy with that. Beautiful and a very thoughtful gift! I have a pyrography set in the back of my cupboard gathering dust I feel inspired to use it now! Thanks! You should dig it out, I find the hardest part is deciding what to actually burn so having the illustration made it so much simpler. 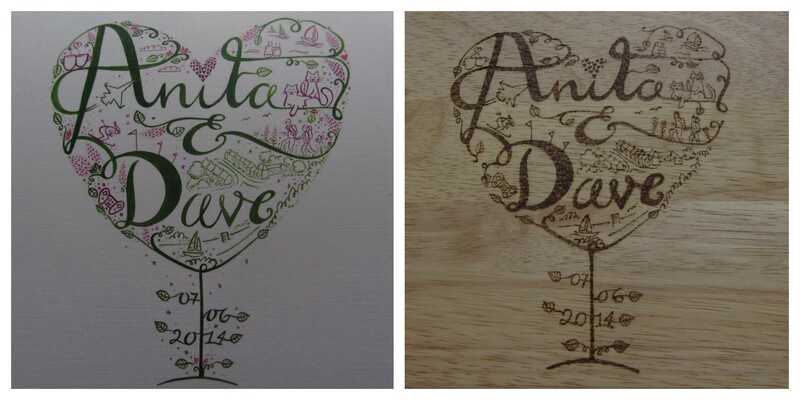 I will and its my parents anniversary soon so im thinking a bread board illustration anniversary gift wish me luck! Good luck! You’ll have to put a photo on your blog once it’s done!